Mark your calendar for one of the greatest wildlife event Gillespie County offers! 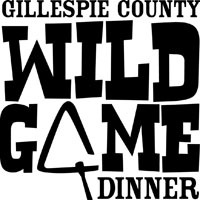 Gillespie County Wild Game Dinner is held November 18th, 2017 at 5:30pm at the Gillespie County Fairgrounds in Fredericksburg, TX. Come support youth and adult agricultural education in the Texas Hill Country. Enjoy our Live Auction, Silent Auction, Prize Giveaways and much more. Dinner & drinks will be served. If you would like to be a donor or sponsor for the event, please contact [email protected] Stop by and see us at our booth. We’d love to see you there! Give us a call or come by the store if you have any questions. This entry was posted on Sunday, September 17th, 2017 at 2:19 pm	and is filed under Events, News & Updates. You can follow any responses to this entry through the RSS 2.0 feed. Both comments and pings are currently closed.